Bachelor of Business Administration is the most popular undergraduate program among students wants to make their career in the field of Business Management. BBA is a 3 years degree program offered by many universities in India. Anyone who has completed 10+2 in any discipline can opt for this course. If you want to do this course in distance education mode, ICFAI university is one of the best option available today in India. The BBA program is offered by ICFAI University, Tripura. The 3 years BBA program helps students gain knowledge and understanding of the basics of management. After completing this course someone can get a job or can pursue an MBA course. 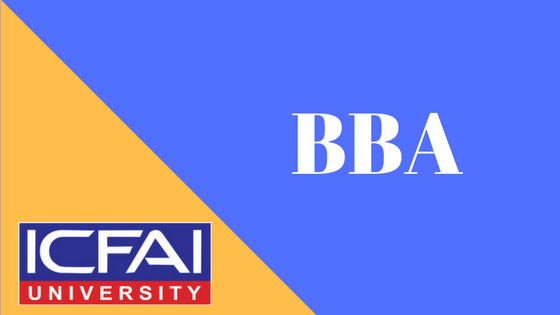 Here are some more details about ICFAI BBA program. Eligibility Criteria: Who can join this course? Anyone who has completed 10+2 in any discipline can apply for this course. The medium of instruction for ICFAI distance education BBA program is English. The students has to complete the program within 6 years from the date of enrollement. The minimum duration to complete this course is 3 years. The BBA program offered by ICFAI university is a self study & examinations program. ICFAI university provides prescribed books for self-study. The fee can be paid year wise. You can pay the fee in one go OR can pay in EMIs. The 1st year's fee structure is given below. For 2nd and 3rd year, the current fee is 12,500 each. Although the fee is subject to change and ICFAI may change the fee. The fee can be paid through demand craft or through debit/credit card. The Demand Draft should be A/c payee crossed in favor of “The ICFAI University, Tripura - Fee Collection A/c” payable at Agartala. In order to become eligible to appear for the examinations, the students are required to enroll into the program on or before the dates given in the table below. ICFAI conducts examinations 4 times in a year. The examinations are conducted in the months of January, April, July and October. ICFAI offers comuter based test (CBT) to conduct the examinations. All students who want to appear into the examinations need to register themselves first and book the slots for each subject for their CBT. Admission Procedure: How to take admission? Students seeking admission into ICFAI Distance Education BBA program need to fill the application form. Application form can be obtain from the nearest ICFAI center. After filling up the the form, students are required to submit the form along with the fee. The complete fee structure is given along with the payment option is already given above in this article. Currently admissions to foreign students are not open. This is because of the visa restrictions. So if you are a foreign student, you can not apply for this program. You must met the eligibility criteria in order to get the admission. If you fail to meet the eligibility criteria set by ICFAI, your application will be rejected. Overall BBA program offered by ICFAI University is a good program. Students can definatly opt for this course to enhance their knowledge about business managament.